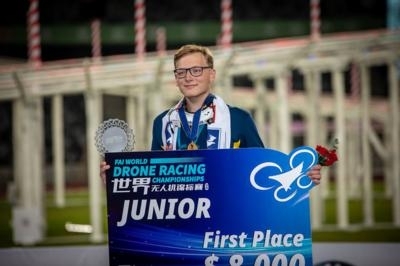 The 15-year-old pilot (pictured) beat 127 other drone racers from 34 countries to win the title and the prestigious FAI gold medal in a final race that was watched by tens of thousands of drone fans around the world. 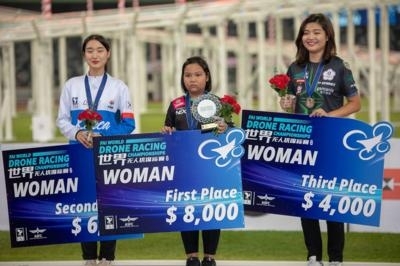 The final of the FAI Drone Racing World Championships came at the end of a four day competition, that was held in the Shenzhen Universiade Center Stadium in Shenzhen, the Chinese tech-city known as the heart of the drone economy. Browning went home with a prestigious FAI gold medal and a $24,000 US winner’s check. Oscar Nilsson, 17 (pictued, below), from Sweden won the Juniors title. One of 44 Juniors in the competition, he was overjoyed at his win. “It feels really good. I was aiming for an overall win, but Junior is also really good. I want to thank my team for the support, and the Norwegian team. We came to China aiming to cooperate and it really worked out. In the Teams, Australia took home gold medals, with Sweden in silver and Korea in bronze. Drone racing is a relatively new sport and has become popular very quickly. In races, four pilots fly against each other around a dedicated drone race track. The first one to successfully cross the finish line wins that race. The track in China was one of the best ever seen in drone racing competition. Built in the shape of a Chinese knot, it was more than 700 yards long and featured three levels. Pilots had to fly up, down and over and through obstacles and gates, testing their skills as pilots. At night the course was lit up with thousands of LED lights, creating a visual experience that both pilots and viewers loved.